On January 1, 2017, four new codes went into effect for occupational therapy evaluations. The American Medical Association (AMA) 2017 Common Procedural Terminology (CPT) Manual lists three levels of occupational therapy evaluation to replace CPT® code 97003 and one level of re-evaluation to replace CPT® code 97004 under the Physical Medicine and Rehabilitation (PM&R) section of the codebook. To use the correct codes in the new system, occupational therapists have to attend to new criteria that distinguish differing levels of evaluation. This webcast provides an overview of the new evaluation codes to assist occupational therapists working within Pediatric settings to make correct coding choices that reflect modern practice. 1) Discuss how CPT® describes the occupational therapy evaluation and reevaluation codes. 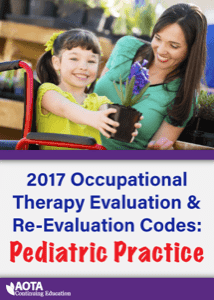 2) Identify the components of the new OT evaluation codes as they relate to pediatric practice in outpatient, Birth-to-Three, and school-based practice. 3) Select the appropriate code to reflect the level of complexity of the pediatric evaluation performed.